On Saturday 14th January 1899, London Irish beat Sutton by 2 goals to 1 try at Herne-hill. Straight after the match, the First XV left rather quickly for the train station, and took the overnight boat-train for Paris. The following morning they arrived in Paris after a long tiring journey, the team prepared themselves for a match against Racing Club de France. The captain Richard Seymour Vivian Dyas won the toss, and the match started. The match was all Irish, with Louis Magee almost scoring a try in the first few minutes, and the French defence having to touch down on five occasions, to start the Irish from getting any points. During the first half, Charles Vincent Fox, an officer with the Scots Guards, was injured and had to leave the field, leaving Irish down to fourteen men. After dominating for must of the half, Richard Dyas, managed to break free, and scored between the posts, the extra points being kicked by P. McGinty. Within a few minutes, Louis Magee darted for the line and scored a try, the kick going wide. At the start of the second half, the home side came out fighting, and eventually crossed the Irish line, and scored a try, which they converted to a goal. But the French teams fight back was short lived, when Louis Magee dived for the line and scored another try, Richard Dyas converting. There was no further scoring in the match, and it ended with Irish winning by 13 points to 5. Louis Magee being praised for his play. The team spent the evening being wined and dined by the Racing Club, before heading back to London the following day. The team was: Robert Quane (full-back); Charles Vincent Fox, Richard Seymour Vivian Dyas (captain), J. Thunder, and J. Broderick (three-quarter backs); P. Murphy, Louis Magee (half-backs); T.M. McInerney, Percy Maclear, George Frederick Boothman, R. Neville, Thomas M. Donovan, W. Hayes, P. McGinty and G. Kemp. 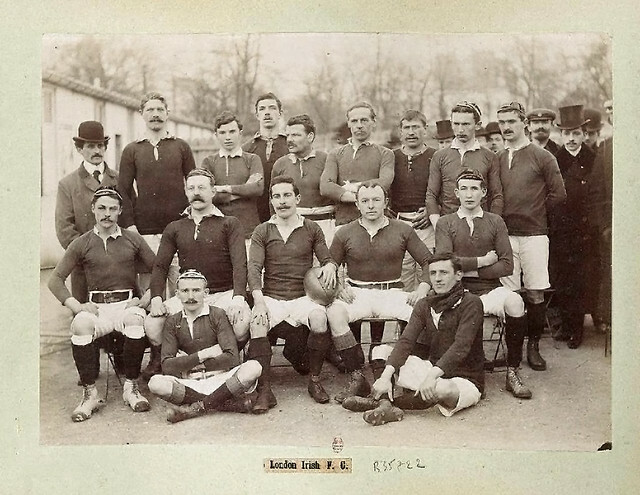 The press afterwards spread rumours that London Irish had sent a team of ringers over to Paris, with one reporter stating that at least half the team where Internationals. In reality, the only Internationals that played for Irish that day was Louis Magee, and Thomas M. Donovan who was picked to play for Ireland against Scotland in 1889 whilst studying at Queen’s College, Cork (he was Doctor based in Birmingham, and used to travel down to play for Irish on match days).